* First budget Cardioid Microphone with high sensitivity. A Cardioid pickup pattern that picks sound from front with noise cancellation from sides and back. * Good Design, Perfect Grep Plug and Play Condenser Microphone with 3.5mm Stereo Audio Jack Plug, TRRS 3.5mm and USB, No Software is Needed. * High compatibility with all PCs, Notebooks, all iPhones and Android Smart phones and Tablet made after 2010, game consoles xBox 360 and almost all devices. 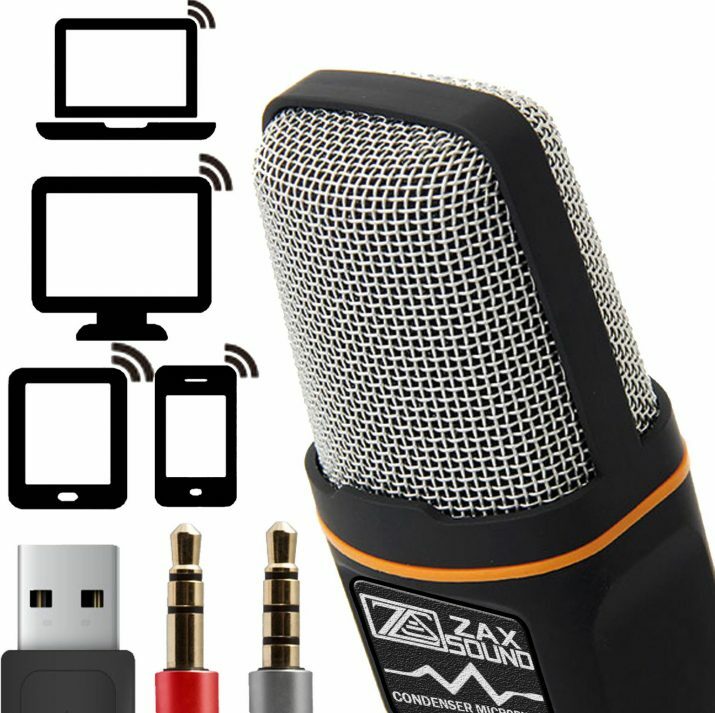 * External Microphone with 6 feet cable for Windows 10 / 8.1 /8 / 7 and Mac PC Computers, Laptops Providing Clear Digital Stereo Sound. * Use Your Smart Phone to Record Your YouTube Videos From 10 Feet Far in a Quite Room. Comes with a Tripod Stand Allows you to Adjust the Angle of the Microphone. • Clear Digital Sound and Classic Design High Quality Cardioid Condenser Microphone for PC, Laptop, iPhone, iPad, Android Smart Phones, Tablets and xBox 360. • Cardioid Pickup Pattern Microphone, The First ever at budget price, this Mic will cancel all noises from sides and back, High Quality & Perfect for live web casting and YouTube recording. • High Sensitivity Microphone, -34db Sensitivity, The Microphone will pickup the sound from 12 inches away. Unlike cheap Microphones where you need to kiss the Mic to be able to pickup any sound. • Compatible with 3.5mm Audio Jack, TRRS 3.5mm Audio Adapter to be used with smart phones & USB Audio Adapter to be used with PCs/Laptop for ultimate devices compatibility. • Mini 3-Legs Tripod Flexible Stand, Ability to be Moved and Adjusted 180 degrees. • Cable Length up to 6 feet, Excellent for chatting over Skype, Making YouTube Videos with Excellent Recording Sound up to 10 feet in Quite Room. • 1 x Cardioid Microphone – 6 feet unattached cable length. • 1 x Audio Speaker/Headphone Splitter for Mobile Phone, Tablet and xBox 360 connector. • 1 x USB Audio Adapter for extended compatibility with PCs and Laptops. Please Check User Manual and User Guide PDF.